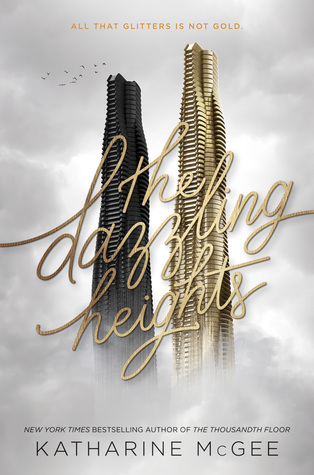 Some spoilers from The Dazzling Heights and the first book The Thousandth Floor may occur. Please read with caution if you have not read these two books yet! **I do not reveal any major plot points! So I was a little peeved when I started reading this book because it started exactly the way the last book began: describing a crime scene where an unknown person is seemingly dead. So the rest of the book, you keeping asking yourself “who is this mystery person?” And “who done it?” Which with the first book was a great way to start! It hooked me from the beginning. This time I was a little upset that it started the same way so I immediately lowered my expectations of this plot. HOWEVER my mind was quickly changed as I was once again immersed into the brilliant, sci-fi, futuristic world of this series which is so skillfully crafted and laid out. I really appreciate the world building in this series. I quickly forgave the author for beginning this book in the exact same way because by the end, it made total sense. I said this in my review of The Thousandth Floor and I’ll say it again: this is like Pretty Little Liars and Gossip Girl rolled into one and set in a technology advanced society in the future. And yet somehow, even though its the age old story of rich, entitled kids finding themselves surrounded by a world of impossible secrets and dangerous people, The Dazzling Heights feels fresh and new. Bottom line is I was pleasantly surprised by this second installment and am impatiently awaiting the day when we learn the conclusion of this story. Definitely worth it to check out both of these books and be sure to read my review of the first book The Thousandth Floor here!